SKGP lost a molar last week, complete with filling. As of yesterday, SKGP is now 10 years old. EJP turned 7 last month. Zoe started out at 9 lbs, and is now 27 lbs, and growing. School begins in 3 weeks. 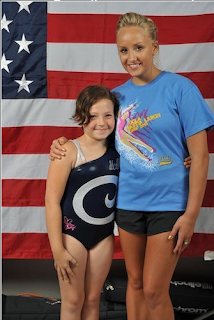 SKGP is back from Nastia Luikin's UCLA Gymnastics Camp, and I think she had a great time. She managed to stay the entire time, even though she had some homesickness. She liked the food. Details have been difficult to extract. My father made a bet today. 1. He believes within the next several months, Apple will release an iPhone 4 with a changed antenna. That is, there will be a hardware fix. 2. He further believes that Apple will them offer some incentive to current iPhone 4 users to move to this new phone, such as $100 credit. I could possibly see the first coming true, but very unlikely. If Apple decides to do a cosmetic fix (e.g., some version of duct tape over antenna gap), they could get that out in the next couple months, but that's not really the Apple way. I think he's out of his mind with his second statement. On a related note, does anyone know how I can get an iPhone in my hands? Yesterday, the kids and I went to San Francisco to go to the Exploritorium. We parked the car and used Yelp to find a corner store that made sandwiches for lunch. Then, we wandered into the Presidio to find a bathroom, and I remembered that there was a statue of Yoda nearby, which we found. Then we spent several hours playing with the amazing exhibits at the Exploratorium. I hadn't been in over twenty years, and it was still amazing. We did a little bit of driving around the City -- went down curvy Lombard, drove by the TransAmerica building -- and came home, hitting Aqui in San Jose for dinner.